There's some really impressive stuff happening in the .NET Community lately. Folks are reaching outside their standard built-in tools and pulling inspiration from everywhere. It's been said that (some) Microsoft developers don't like to use tools or technologies that aren't built in to Visual Studio. However, myself and others have been pushing the concept of LEGO blocks snapping together. Rather than thinking of Visual Studio as a giant single block, consider it as a small block amongst many others. Feel empowered to choose the technologies that work for you and discarding the ones that don't. I talked about this LEGO analogy in my DevDays keynote in The Netherlands earlier in the year. Snap in tools like the HTML5 Web Standards Update for Visual Studio, loggers/profilers/debuggers like Glimpse, MiniProfiler and ELMAH, Package Managers like NuGet and OpenWrap, all work together to make your development experience more enjoyable (and some new Visual Studio Styles/Themes and a little fresh wallpaper never hurt either! 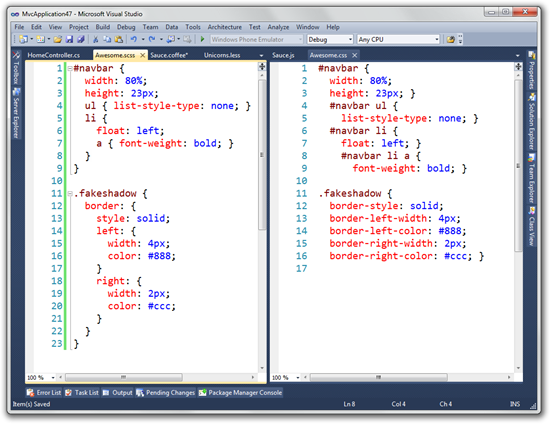 You can even make VS2010 look like 2008 if it make you happy). One of the most impressive (free!) tools I've seen lately is the Mindscape Web Workbench. It is a 100% free plugin for Visual Studio 2010 to provide CoffeeScript, Sass and Less editing. What? CoffeeScript? Sass? Less? What are these silly names and why should I care? Well, remember when I blogged about "fanciful names?" These are some names you'll want to know about. Here's a little about each and how Mindscape makes them fun for Visual Studio Developers. 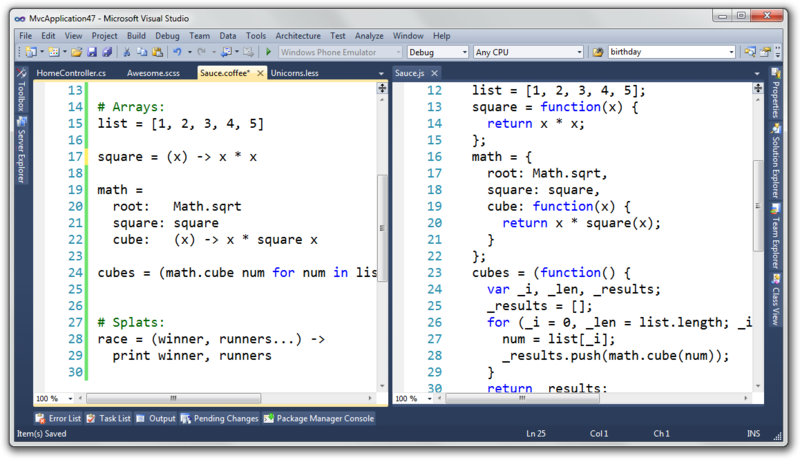 Here's what it looks like in Visual Studio. Oh, yes. All this is enabled by the Free Web Workbench. 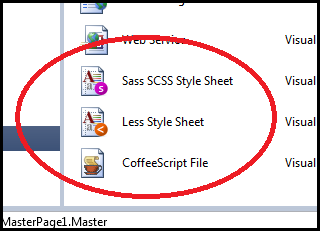 Sass could mean Super Awesome Style Sheets. It's a meta-language on top of CSS. A better, redesigned CSS that is still a super set of CSS itself. CSS, cascading though it is, is still very flat. If you write this SASS, it makes sense, doesn't it? It's intuitive and you might even think it's CSS as it is. Which would you rather write? I'm sold. Sass uses an indentation syntax primarily but you can use brackets rather than indentations and semicolons rather than new lines. It's up to you. I like mine to look like nested CSS. 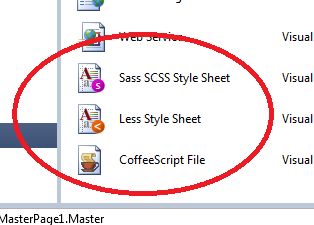 Your Sass files are converted into CSS as you click save in Visual Studio. It's a wonderfully clean integration. Sass is attractive because you really don't need to learn another syntax. You just use scoping and indenting rules you already know and you get cleaner CSS. Because of this, the Web Workbench doesn't do the same automatic developer-time conversion of LESS files. For me, this makes LESS (ahem) less attractive. That said, you still these features from the Web Workbench, which is nothing to sneeze at. Interesting stuff. I think it's important not only that you, Dear Reader, give this stuff a good hard look, but that you continue to look for ways that the open source community, both .NET and otherwise, are innovating. You maybe able to integrate these tools easily into your existing projects and not only have more fun but be more productive. Thanks so much to the folks at Mindscape for releasing this free and elegant tool! .less can run server side, with Dot Less. It's just as simple as registering an HTTP Handler for the extension .less. We've had some really great feedback about the Web Workbench and supporting compiled LESS is something we are looking at adding support for in the near future. The updates through the Visual Studio Extension Manager is a great way for folks to keep grabbing the latest bits - bug fixes, general improvements and new features. Sass looks really nice, and LESS brings an interesting concept... actually a combination of the two would be ideal! and that does not work as intended. And this is a trivial example. But what if you have a .big nested in an anchor element in LESS or SCSS? Is that really a .big or a.big? Two very different things. But all in all LESS and SCSS are still way better then writing CSS the old fashioned way. I hope Mindscape includes the LESS compiler and removes those annoying sqiugglies. I'm surprised no one's developed a Compass compiler that integrates into Visual Studio. Compass let's you add dynamic mix-ins and functions to Sass. Like Less - but all on the server side. It's easy to install, just install ruby (www.rubinstaller.org) and grab Compass (www.compass-style.org). I build a little Windows service that will watch a folder and subfolders for modified Sass files and automatically recompile them into css. If this would be useful for you, @lucasjans on Twitter. IMHO, the introduction is not whole. Sass supports a small set of extensions called SassScript. SassScript allows properties to use variables, arithmetic, and extra functions. please see: a@href="http://sass-lang.com/docs/yardoc/file.SASS_REFERENCE.html#sassscript"
Tried this - 100% over-hyped ..... it crashed VS2010 within seconds ..... I will stick with Chirpy which has given faultless service for may months. @John, I'd love to resolve the issues you're having. It absolutely should not be crashing VS2010 and that behavior is not something we have seen before. Having said that, perhaps there are extensions conflicting and causing issues (we do have folks working with Chirpy and the Web Workbench happily so it shouldn't be that). @gligoran We're looking at getting the LESS compiler included as it has been requested a lot. We tighten up on the squigglies with each release. If you have specific situations do not hesitate to send them to us and we'll ensure the parser is doing the right thing. Squigglies are only good if they are showing actual mistakes, otherwise, as you say, they're just annoying! Scott, what are you thinking? Why would you publish these last two articles just before the first nice weekend we've had in weeks (I'm in Western Washington)? Next time try to publish these type of articles before crappy weekends please :). Note the ampersand in front of :hover. This will do what you want. @John-Daniel: That would be great to have a built-in LESS compiler. There are a lot of squigglies in my styles, but an example from the starter ASP.NET MVC 3 application in the Site.css is the font-size: .85em. Note that there's no leading zero. I've checked this with the W3C validator and is valid CSS. Your editor marks it as syntax error, although it SCSS compiles it correctly. Also I would be great to have the Format Document functionality as CSS and other native Visual Studio documents have, but that's of lower priority. the indented + and > are squiggled. Vs SASS creating it's own DSL with crazy whitespace/tab issues targeted towards ruby programmers. (of course it now supports regular CSS, but only after Less came out). The plugin will definitely have value when the Less syntax being supported without errors from within Visual Studio and Dot Less itself integrated. I've also used the Chirpy plugin, and find it to be good for my needs. Not only does Chirpy support LESS, but also lets you run minification on CSS and JS, as well as combining multiple files into one. For some reason i'm not getting syntax highlighting on .less files (works fine on .sass though). Anybody else is having the same issue? Awesome stuff there - Sass really appeals over LESS though because it doesn't require delivery of a 34k JS file. I've been wishing for a way to have variables/constants in CSS for years now and this is a wish granted. Very little learning curve too, which is great. I know these are just examples but, to me, the SASS examples make things less readable. Thanks, great! Interestingly written review. Using business process solutions it is the best way to obtain mobile software development. Loved VS doing less, sass and coffee stuff. But I feel like we stay in the dark for toooooooo much time before we see a ray. As always. BTW: You can use DotNetLess command line tool in "watch" mode. This will compile your .less file every time you modify it. This less you see the .css output as you are coding. Visual Studio will see the file change if you have it opened in an editor as well. If I didn't know better, your article makes it sound like SASS only has nested styles and, while LESS has a whole bunch of extra stuff like variables, mixins and functions as well as nested styles. They're pretty much the same. SASS also have all those things. I'd have to agree with a number of commenters there's a lot of OLD OUTDATED MISSINFORMATION on blog posts that look at both Less and SASS, in particular citing the client-side compilation I've used Less for over 10 months now and not once have I used the client-side scripts. Everything I deliver is pure CSS. Please update the blog post to make it clear that Less can be compiled OFF the client exceeding easy, there are a number of options. WinLess, I've used this when using a windows box and works a treat. Works very similar to Less.app, watches files & folders for changes to .less files and automatically compiles the CSS on changes to these files Win Less. If you're using Visual Studio, that I imagine people reading this post are WinLess also have a really simple script that allows you to add the compilation of the CSS to the build event of the Visual Studio Solution. So rather than generating the CSS on every save it will compile on when you compile your C#, or whatever. The benefit of LESS is we do not need to care about output. The worse side of SASS and LESS is that we cannot easily append live updates directly from firebug , back to css files. In normal cases you have SAVE Button in LIVE preview mode of CSS files inside firebug. And if you do not use webkit stuff you can save back. I keep webkit stuff, gradients etc in different files. Thanks for the tip on the extension. DotLess is not so hot...it broke my build with the latest Twitter Bootstrap release. I discovered it is just a port of less.js and lacks full LESS compatibility. I switched to http://winless.org which directly uses less.js and therefore offers full compatibility.